January 29th, 2015, Hard Rock CafÃ© Andheri, Mumbai: When most Mumbaikars are spoiled for choice, made to choose between Malayalam rock band Avial at Blue Frog, rappers at gig series BOMB Thursdays at 3 Wise Monkeys and author-singer Tanuja Desai Hidier’s book and album launch show featuring the likes of DJ Uri, what would make anyone come out to watch a Hindi rock band at Hard Rock CafÃ©, a venue infamous for its sound issues? A band from out of town armed with a new lineup and a mind-bending second album? Delhi psychedelic pop/rock band Faridkot, who were back in Mumbai, had hit a high after releasing Phir Se? in May last year, and toured the country to promote the album. But six months on, the band has changed its lineup once again ”“ samples-in-charge Akshay Raheja and bassist Gavin Pacheco left the band in 2012. 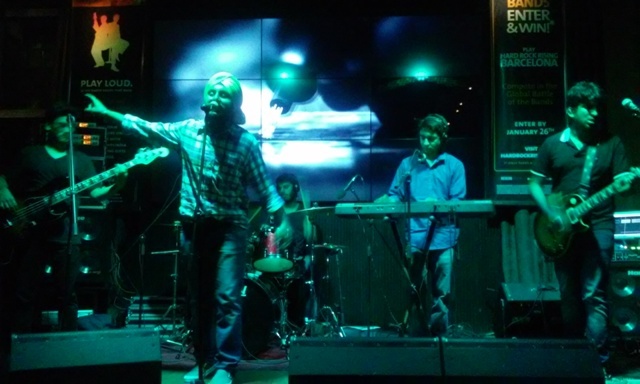 FaridkotÂ brought in NikhilÂ Rufus Raj (bassist from rock band The Superfuzz) and drummer Sahil Mendiratta the same year and added keyboardist Akshat Taneja in 2013. Late last year, the band parted ways with Raj, Taneja and Mendiratta over differences. Faridkot’s Mumbai gig featured Delhi musicians such as bassist Hemant Chona from psychedelic rock band Mindflew, drummer Abhijit Sood from rockers Soul’d Out and keyboardist Anil Chawla part of singer Shubha Mudgal’s live band and jazz rock band Grey Area. The new lineup brought pure rock goodness to tracks such as “Aaina.” andÂ already sounded like they’ve been playing together for a long time. The band’s two remaining founding members ”“ vocalist IP Singh, who was faultless in his soaring vocals throughout the night, and guitarist Rajarshi Sanyal, ripping into a Hendrix/Page-esque solo every now and then ”“ also took Faridkot in a new direction. And for bonus, the venue’s sound didn’t act up for once. Faridkot also dipped into a Bollywood playlist, from a rock ”˜n roll-infused medley devoted to singer and actor Kishore Kumar [comprising bits of “Samne Yeh Kaun” and more and “Mere Bhole Balam”] and RD Burman’s “Aaja Aaja Main Hoon Pyar Tera” from 1966’s Teesri Manzil. The time capsule even traveled to the Nineties, with the Javed Jaffery rap song “Mumbhai,” and finally to a Amit Trivedi medley from 2009 film Dev D.
Before the Bollywood medleys, they warmed up with a rendition of Pakistani vocalist Javed Bashir’s song “Aj Latha Naeeo” that would have even made the Mekaal Hasan Band’s powerhouse vocalist proud of Singh. They could have done with a few less covers, although that’s a tall ask for a band playing to just about 50 people at a Hard Rock CafÃ©. Maybe the next time they head to another venue, Faridkot will have more fans asking for their original songs.